The CareGiver Partnership: Are Depends Diapers The Right Choice? As you select adult diapers from Depends, you will want to first understand how much urine loss you are dealing with each day. Some people have a light dribble of urine where others will end up with a complete emptying of the bladder. Understanding how much urine loss you have will allow you to select the adult diapers that can absorb all of the urine that you lose through the day. Depends undergarments can come in washable form, which is less expensive in the long run. In addition to the undergarments you can select Depends pads, which fit right into your regular underwear. The pads are easy to change out and make it easier on you to manage incontinence discretely. Absorbency is an important part of choosing incontinence products that will prevent others from detecting your condition. Proper absorbency will also prevent leakage from occurring. When you try out the Depends diapers you will find that they do fit snugly against your legs, which can prevent you from having leakage. Based on the type of incontinence, you may need to change out your incontinence product several times a day. Always take this into consideration as you are choosing the best incontinence supplies to manage your case. It is a smart idea to consider trying out multiple types of adult diapers to see how comfortable they are. Selecting the adult diapers that will be able to give you the right type of protection is vital but you need to ensure that they are comfortable. Depends undergarments will pull the urine away from the skin, allowing it to breathe so you do not end up with rashes. Depends diapers will also come with odor protection, which allows you to manage your condition in public settings. A large part of choosing incontinence supplies will come down to the way that they fit on your body and allow you to go about your daily activities. Depends diapers come in thick and thin options, which make it easy to go on about your business without others seeing your diaper. Some of the old adult diapers used to make a plastic noise when you walk. Some of the larger adult diapers still do this but for the most part they are quiet now. 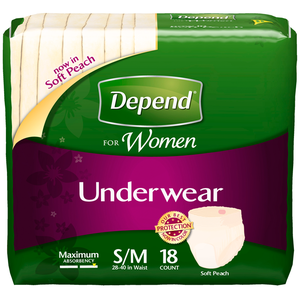 The Depends undergarments are made with cotton and fit like your regular underwear, making it harder to detect. This also allows you to feel like you are still wearing your regular underwear so you aren’t as embarrassed. Choosing the best adult diapers will also come down to what you can afford. Your insurance may help to pay for adult diapers if you have a Flex Spending Account. Depends diapers come in washable and disposable options. The washable options can save you more money over the course of relying on incontinence supplies. The disposable diapers can be easier to deal with for most people as they aren’t as messy.